A popular holiday activity in Pasadena is a stop off at the Balian House which brings us to day 210 of 365 Things To Do In Pasadena! 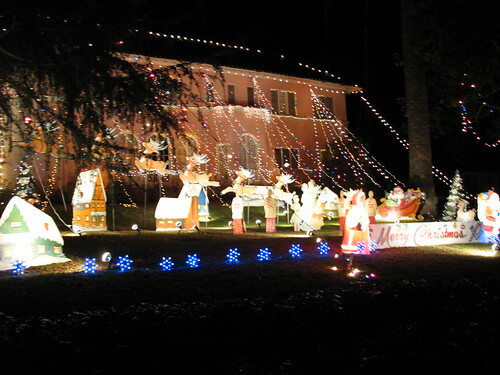 Balian House is actually located in Altadena and can be combined with Christmas tree lane by turning right on Altadena to Allen. Turn right on Allen and then left on Mendocino. Like a community castle, the 1922 Mediterranean-style mansion owned by ice-cream magnate George Balian, at the fork of Mendocino Lane and Glenview Terrace, sits majestically aglow with thousands of lights, drawing busloads of visitors, pushcart vendors and strolling carolers. For many, many years the Balian family has decorated their mansion and the 3.5 acre of land that surrounds it. In fact, they started the lighting display back in 1955! Park and join the throngs enjoying the sights. I spent part of my growing up years in Altadena–Altadena Dr. west of Lincoln–and the mansion was a yearly Christmas adventure that continued even after we moved to Temple City and eventually to Running Springs in the San Bernardino mountains. It continued with my own children while living in the San Bernardino area and the mountains again but sadly stopped in 1996 when we moved to Arizona. How I wish we could take our grandchildren to see it now! My husband suggested googling it this morning, which then bright me to this site, and how happy I was to see that if still continues! I first saw the wonder in 1961 as a four-year-old little girl. Thanks, Balians for keeping my memories of my favorite time of year alive. Have you been to Balian House? Send in your photos to info at PasadenaViews and we will post them here. Enjoy!